Sonia Gandhi (born Antonia Edvige Albina Maino on 9 December 1946) is an Italian-born Indian politician and the President of the Indian National Congress, one of the major political parties of India. She is the widow of former Prime Minister of India, Rajiv Gandhi. She agreed to join politics in 1997; in 1998, she was elected as the leader of the Congress. Since then, Sonia Gandhi has been the President of the Indian National Congress Party. Sonia Gandhi’s involvement with Indian public life began after the assassination of her mother-in-law Indira Gandhi and her husband’s election as Prime Minister. 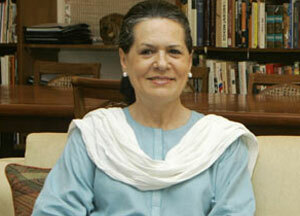 In 2010, Sonia Gandhi ranked as the ninth most powerful person on the planet by Forbes Magazine. She has two children, Priyanka Gandhi Vadra and Rahul Gandhi, who is also a politician. Pratibha Devisingh Patil (born 19 December 1934) is the 12th President of the Republic of India and first woman to hold the office. She was sworn in as President of India on 25 July 2007, succeeding Dr. A.P.J. Abdul Kalam and after defeating her rival Bhairon Singh Shekhawat. 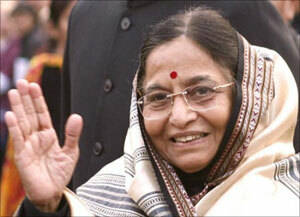 Pratibha Devisingh Patil was born in Jalgaon District, Maharashtra. Pratibha Patil started her professional career as a practising lawyer at the Jalgaon District Court and worked on various social activities, especially, for the upliftment of poor women. She was the 24th Governor of Rajasthan between 2004–2007, and the first woman to hold that office. Sheila Dikshit (born 31 March 1938) is the Chief Minister of Delhi. She is from the Indian National Congress. Dikshit was sworn in as the Chief Minister for a third consecutive term of the Government of Delhi state in January 2009 after pulling a victory in November 2008 state elections. She is the second woman Chief Minister of Delhi and represents the New Delhi Constituency in the Legislative Assembly of Delhi. She holds a Master of Arts degree. She received her education in New Delhi, and later Miranda House, University of Delhi. She was married into the family of Shri Umashankar Dikshit. Her late husband Vinod Dikshit was a member of the Indian Administrative Service (IAS). She has two children, son Sandeep Dikshit, who is a member of parliament from East Delhi for Congress and daughter Latika Syed. 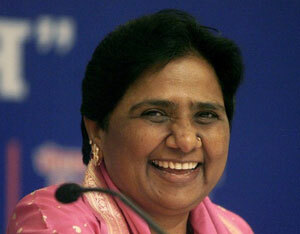 Mayawati (born 15 January 1956) is the Chief Minister of Uttar Pradesh, India. She heads the Bahujan Samaj Party, which represents the Bahujans or Dalits, the weakest strata of Indian society. This is her fourth term as Chief Minister of Uttar Pradesh. An icon for millions of India’s Dalits, who were oppressed by the Hindu upper castes for centuries, she is often referred to as Behen-ji, which means sister. Mayawati’s tenure has attracted considerable controversy. She is now India’s richest Chief Minister. The rise in her personal wealth and that of her party are described by critics as indicators of corruption. Mayawati’s past birthdays have been major media events, where she appeared laden with diamonds. Her supporters have declared her birthday as Jan Kalyankari Diwas (People’s Welfare Day). Mamata Banerjee (born 5 January 1955) is the 11th and current chief minister of the Indian state of West Bengal. She is the first woman to hold the office. Banerjee founded All India Trinamool Congress in 1997 and became chairperson, after separating from the Indian National Congress. 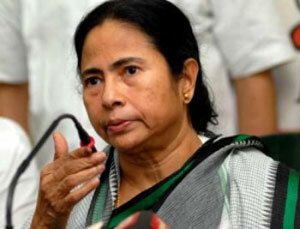 Currently she is also in charge of nine key departments of the government of West Bengal, including Home, Health and Family Welfare, Land and Land Reforms, Information and Cultural Affairs, Minority Affairs and Madrassah Education, Agriculture, Power and Home (Personnel and Administrative Reforms) departments. Banerjee is known as a firebrand orator and popularly referred to as “Didi” (meaning elder sister) to all her followers. Banerjee previously served as a Minister of Railways twice, Minister of Coal, and Minister of State for Human Resource Development, Department of Youth Affairs and Sports and Women and Child Development in the cabinet of the Indian government. 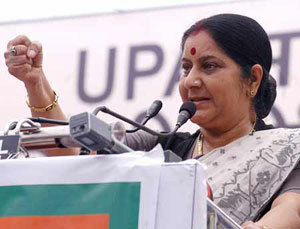 Sushma Swaraj (born 14 February 1952) is an Indian politician of the Bharatiya Janata Party (BJP)and Member of Parliament. She is currently the Leader of the Opposition in the 15th Lok Sabha. 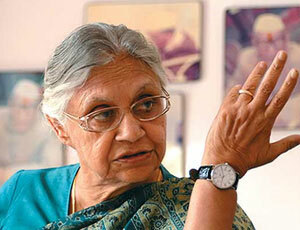 She is a former union cabinet minister of India and a former Chief Minister of Delhi. Also she served as the Chairperson of the BJP’s 19 member campaign committee for the 2009 General Elections. She was the first female chief minister of Delhi. She was born in Palwal, Haryana in a Hindu Family. She was educated at S.D. College, Ambala Cantonment and earned a B.A. degree. She studied LL.B. from the Law Department of Punjab University, Chandigarh. She is an advocate by profession. She has been associated with many social and cultural bodies in various capacities. She was President of the Hindi Sahitya Sammelan, Haryana for four years. Vasundhara Raje was the Chief Minister of Rajasthan state of India from December 2003 till December 2008. She is the first woman Chief Minister of Rajasthan. 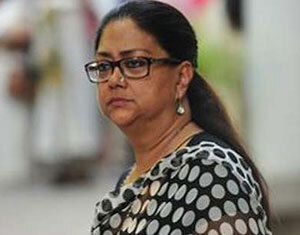 Vasundhara Raje was born on 8th March 1953 in Mumbai. She is daughter of Vijayaraje Scindia and Jivaji Rao Scindia of Gwalior, members of the prominent Scindia ex-royal maratha family. Vasundhara Raje was initiated into politics by her mother in 1982. She held a variety of posts in the Bharatiya Janata Party (BJP) and was elected to the Rajasthan Legislative Assembly in 1985. From 1989 onwards she won four consecutive elections to the Lok Sabha from Jhalawar, Rajasthan. Vasundhara Raje’s five-year term as Chief Minister was marked by a strong focus on infrastructure-building and social initiatives, but it was also noted for caste violence and rebellion by local leaders against Vasundhara’s firm style of leadership. 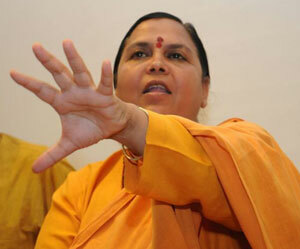 Uma Ragini Bharti (born May 3, 1959, Tikamgarh, Madhya Pradesh, India), is an Indian politician. She was born in Tikamgarh District, Madhya Pradesh to a religious Lodhi Rajput family and from a very young age, started holding discourses on Indian Epics.Her father was an atheist. Raised under the care of the late Rajmata Vijayaraje Scindia of Gwalior, Uma Bharati, along with Sadhvi Ritambhara, played a prominent part in the Ayodhya Ram Janmabhoomi Movement. In the 2003 Assembly polls, she led the BJP to a three fourths majority in Madhya Pradesh. She defeated her Congress opponent from the Malehra seat with a 25% margin. Uma Bharati resigned from the post of Chief Minister of Madhya Pradesh in August 2004, when an arrest warrant was issued against her regarding the 1994 Hubli riot case. Jayalalithaa Jayaram born 24 February 1948) commonly referred to as J. Jayalalitha, is the Chief Minister of the state of Tamil Nadu, India. She is the incumbent general secretary of All India Anna Dravida Munnetra Kazhagam (AIADMK), a Dravidian party. 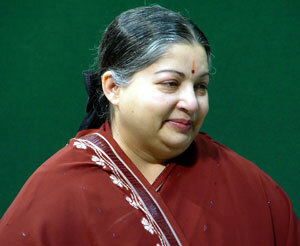 She is called Amma (‘Mother’) and Puratchi Thalaivi (‘Revolutionary Leader’) by her followers. She was a successful film actor in Tamil, Telugu, Kannada and Hindi before entering politics. She got her first break in Tamil movie industry in Vennira Aadai (1965), directed by C. V. Sridhar. The following year, she made her debut in Telugu cinema with the film Manushulu Mamathalu. She was the first heroine to appear in skirts in Tamil films. Jayalalithaa was born on 24 February 1948 in a typical Mandyam Iyengar family and Jayalalithaa’s father, who had been a wealthy lawyer, died when she was two years old having lost all of his money. 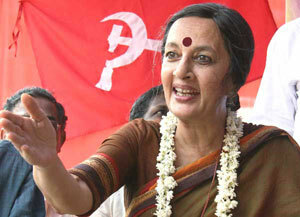 Brinda Karat (born 17 October 1947) is a communist politician from India, elected to the Rajya Sabha as a Communist Party of India (Marxist) CPI(M) member, on 11 April 2005 for West Bengal. In 2005, she became the first woman member of the CPI(M) Politburo. She has also been the general secretary of the All India Democratic Women’s Association (AIDWA) from 1993 to 2004, and thereafter its Vice President. She is married to Prakash Karat, a Keralite by origin and a prominent CPI(M) leader, holding the position of General Secretary currently. Her sister Radhika Roy is married to Prannoy Roy, founder and CEO of NDTV. Brinda is the author of Survival and Emancipation: Notes from Indian Women’s Struggles. This is a comprehensive book on the wide ranging concerns of the women’s movements in India from a left perspective.